This article will guide you how to install ELM327 USB cable/scanner on your Windows computer. It will then work with any OBD2 software and your car. If you bought genuine ELM327 cable from Total Car Diagnostics — then you only need to install DRIVER PACK 3. After install — go straight to Step 2 to test if it's working. If you bought genuine ELM327 cable from Total Car Diagnostics here, then you only need to install DRIVER PACK 3. Then go straight to Step 2 to test it's working ok.
DRIVER PACK 5 Most Important! Please FIRST move the unextracted folder to your Desktop, else below #2 step won't show "Install" option. Install. That's it! The yellow triangle next to "Prolific..." should be gone. Ok, we're almost ready to start scanning your vehicle. First, let's ensure that everything is working fine! Step 2: Expand "Other Devices" and "Ports (COM & LPT)"
NONE of above devices should have a yellow mark ( ) next to them. Connect cable to laptop. Yellow mark should now be gone. Success! a) While cable is plugged in, right-click on device with the yellow mark. d) Browse to and select folder where you unextracted Driver Pack 6. Make sure "Include subfolders" is ticked ON. h) If g above is true, then do steps a-f for "Unknown Device". It may also show as "COMx". Even DRIVER PACK 6 didn't help? Then likely it's a "Code 10 error" next to "Prolific USB-to-Serial" device. Click here to fix that. Even "Code 10 error" fix didn't help and yellow mark ( ) is STILL not gone? Go to Troubleshooting below. 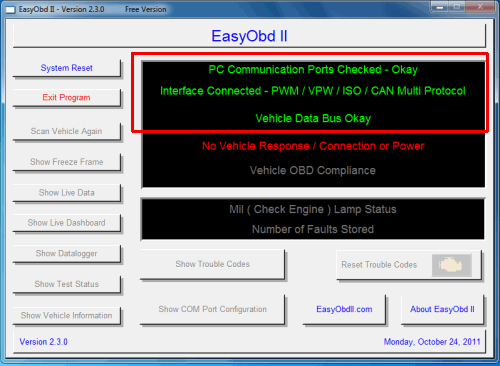 Step 1: Install your OBD2 software (if you don't have it — checkout TOAD OBD software). Do NOT launch it yet. Step 2: Connect ELM327 USB to your computer and car's OBD port (usually underneat dashboard/steering wheel). Step 4: Start your OBD diagnostic software. Click "Connect", and it should auto-connect to your vehicle. That's it! TIP: If you want maximum data reported from the car — turn on the engine. Yes, you can safely drive the vehicle while ELM327 is plugged in and application is monitoring car's data. Keep eyes on the road at all times. First check that ELM327 is physically working (not defunct). When you plug in the cable into a USB port, all the lights on ELM327 interface/device should flash. And then it'll return to 1 red light (power). Condition of a defunct ELM327 interface: All lights will not initially flash, and only red light will be on. Restart computer (while keeping cable connected to laptop). Try again. Plug USB into different physical port of your computer. Try again. Step 1: Go to Control Panel. Step 2: Expand "Ports (COM & LPT)" and "Other Devices". Step 4: Contact us and attach the picture. Step 1: Install EasyOBD. Do not launch it until Step 4 below. Step 2: Connect ELM327 USB cable to laptop and car. Step 4: Launch EasyOBD. It will automatically connect. If first 3 lines are not GREEN — refer to Common Solutions above. First 3 green lines means your ELM327 cable/Windows is properly installed. ELM327 AT Commands: List of commands you can manually type into OBD software terminal.